macOS (OS X) TransGaming Inc. This page is for the 2008 reboot. For the original, see Prince of Persia. The Epilogue DLC is not available for this game; it was only released for the console versions. Delete or rename Ubi_Logo.bik. If you're playing in a non-English language, rename the Ubi_Logo.bik inside the relevant language subfolder. Graphics settings in the launcher. Example of a glitched, 16x AA launcher option. Do not select this option, if you see it. Up to 8x MSAA. There can be a glitch with Nvidia GeForce 10xx GPUs that causes a 16x option to show in this menu. Selecting it will cause the game to crash on launch. Single buffered. Force triple buffering externally if having frame rate issues. Go to HKEY_CURRENT_USER\Software\Ubisoft\Prince of Persia\1.0\Engine\. 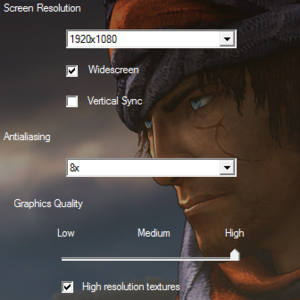 Change ScreenResolutionHeight and ScreenResolutionWidth to the desired resolution. Click on "Edit", then "Add". Set the "Path" to <path-to-game>\PrinceOfPersia_Launcher.exe. Set the desired window position and size. Set "Desktop" for borderless fullscreen windowed. Set "Native" under "Screen resolution" in the "Video" tab. Click "OK", then "File" and "Save". Double-click the game icon in DxWnd to play. Steam Controller not supported due to not supporting Steam Overlay. When using an Xbox 360 controller the game doesn't display the proper names of the buttons. Launcher requires mouse and keyboard. Create a shortcut for <path-to-game>\Prince of Persia.exe as a workaround. No remap option; only one layout. EAX 5.0. May require DirectSound3D restoration software. Official localization by «Akella». Retail and GOG version. Patch for digital release here. 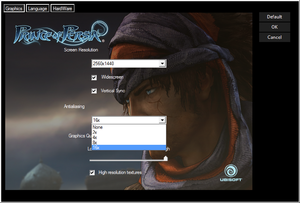 Use Helix Mod: Prince of Persia 2008 (old version) for better 3D support. Opening the Steam overlay in the retail game causes all input (keyboard or controller) to be ignored, requiring a restart of the game. The game will fail to launch while the Steam Controller is connected to your computer. This also means the controller isn't compatible with the game. Possibly related to the Steam Overlay not being supported. 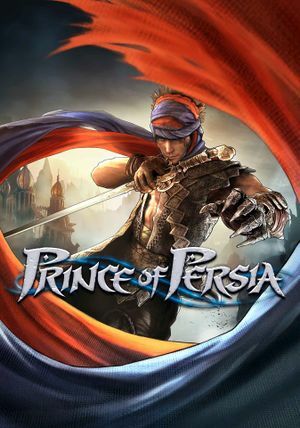 Download the Prince of Persia Windows 10 Patch. Unzip the files to the installation folder. Open <path-to-game>\d3d9.ini or %USERPROFILE%\Documents\My Mods\SpecialK\Profiles\Prince of Persia.exe\SpecialK.ini depending on the installation method you used. 1. Open a text editor and add the following text to it. 2. Save it as a .bat file in the installation folder. 3. Run the file to launch the game. Open launcher and lower anti-aliasing setting. Older drivers, such as 197 or older do not have this issue. ↑ 1.0 1.1 File/folder structure within this directory reflects the path(s) listed for Windows and/or Steam game data (use Wine regedit to access Windows registry paths). Games with Steam Cloud support may store data in ~/.steam/steam/userdata/<user-id>/19980/ in addition to or instead of this directory. The app ID (19980) may differ in some cases. Treat backslashes as forward slashes. See the glossary page for details. This page was last edited on 18 April 2019, at 08:25.